This photo was taken on May 3, 2018 at 11:03 AM. The location was near the Convention Center in Washington DC. The "Take It!" came after the shadow overlap with the upper edge of a municipal trash receptacle cast upon the edge of a Man Hole cover located in the sidewalk. The After Take: What converted this unusual juxtaposing into the possibility of there being some shadow hand holding going on - I will never know. No matter, for those to whom I showed this photo to, after giving a prefacing explanation - all got a kick out of the proposal. There is a chance this relationship could flourish as neither party is really going anywhere and even though there are some other inhabitants on the corner (several signs as well as the base of the traffic signal) none seem to have that match up curve compatibility -high lit, when the sun casts its magic in the form of the making of this shadow when the time is just right. Odd though it may sound, these what may be termed as implements, are welcome and very necessary service citizens and worthy of our respect as they tirelessly serve us well. Here is hoping you got as much of a smile out of reading this, as I did in putting it together. I love the little flowers on the trash can. Beautification! For a couple hours a day, they get to overlap together. 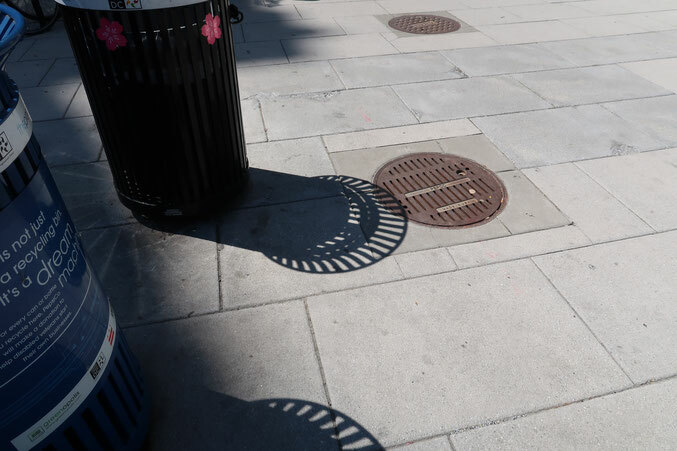 It does look like the shadow would almost perfectly cover the sewer. Those two manholes are really close to each other. I don't think I've ever seen two so close. I can't help but wonder if its the city putting the pink flowers on the cans or if some random person did it.